A research team from Brown University found this size is best and achieved 90 percent conversion of CO2 to CO.
Brown University and the National Science Foundation announced that a group of researchers from the university developed a catalyst from gold nanoparticles that converts carbon dioxide to carbon monoxide, useful in making synthetic natural gas, methanol, and other alternative fuels and commodity chemicals. On a commercial scale, the technique can be a useful tool in eliminating greenhouse gases. They published their results in the Journal of the American Chemical Society. "Our study shows potential of carefully designed gold nanoparticles to recycle CO2 into useful forms of carbon," said Shouheng Sun, a professor of chemistry and one of the study's senior authors. "The work we've done here is preliminary, but we think there's great potential for this technology to be scaled up for commercial applications." "Converting CO2 to CO isn't easy," according to the university’s Oct. 24 news release. "Prior research has shown that catalysts made of gold foil are active for this conversion, but they don't do the job efficiently. 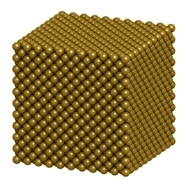 The gold tends to react both with the CO2 and with the water in which the CO2 is dissolved, creating hydrogen byproduct rather than the desired CO."
The researchers tried gold nanoparticles of different sizes, including four, six, and 10 nanometers, but found they were less efficient at the conversion than 8 nanometers, which converted 90 percent. "When you take a sphere and you reduce it to smaller and smaller sizes, you tend to get many more irregular features — flat surfaces, edges, and corners," said Andrew Peterson, professor of engineering and also a senior author on the paper. "What we were able to figure out is that the most active sites for converting CO2 to CO are the edge sites, while the corner sites predominantly give the byproduct, which is hydrogen. So as you shrink these particles down, you'll hit a point where you start to optimize the activity because you have a high number of these edge sites but still a low number of these corner sites. But if you go too small, the edges start to shrink and you're left with just corners." An NSF grant to the Brown-Yale Center for Chemical Innovation funded the research.